Why buy a pair of NuovaHealth plantar fasciitis insoles? Plantar fasciitis is the most common form of foot pain. It is estimated that at least 10% of people will suffer from plantar fasciitis at least once in their lifetime. Plantar fasciitis can cause mild to severe foot pain on the arch and heel of the foot. This pain is usually worst first thing in the morning as you take your first steps of the day and lessens with activity as your foot stretches and becomes less tight. Other symptoms of plantar fasciitis include heel spurs. It is believed that up to 50% people with plantar fasciitis go on to also develop heel spurs. Heel spurs are bony growths that develop on the side of your heel bone to help protect your foot from further damage. However, heel spurs can often cause plantar fasciitis to worsen as they can make your shoes tighter causing further damage to your foot and heel. If left untreated this foot condition can become chronic, that is why it is important to treat your plantar fasciitis. Usually, this injury develops due to overuse and overstretching of the plantar fascia ligament that spans the arch of your foot causing to become inflamed and damaged. This overuse and overstretching can be triggered by excessive pressure or biomechanical imbalances affecting your foot. It is thought that up to 50% of people develop the condition because of obesity or sudden weight gain placing excessive pressure on your arches. Obesity isn’t the only reason you might have developed this foot injury. Runners are also more prone to developing this foot condition, plantar fasciitis accounts for 10% of all running injuries! This is because running can cause overuse of the plantar fascia ligament if you do not properly stretch your feet before you run. Excessive pronation having flat feet or wearing non-supportive shoes have also been linked to the development of this injury. Studies have proven that wearing orthotic insoles combined with wearing a night splint resulted in a huge 47% decrease in pain in patients studied with plantar fasciitis. Many patients also experienced a dramatic improvement in the way that their feet function helping to prevent plantar fasciitis from reoccurring. Insoles designed to treat plantar fasciitis aim to correct problems with your feet that can cause damage to your plantar fascia ligament. Here at Nuovahealth, we have a wide selection of insoles that will help to treat the main causes of plantar fasciitis and keep your feet protected and supported. 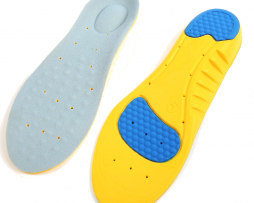 All of our insoles have been crafted using the very best medical grade materials that will help to give your feet better support and will protect them against shock helping your you feet to make a fast and full recovery. Our insoles are suitable for people with flat feet, high arches and those who suffer from bio-mechanical imbalances such as over-pronation and supination. With our full 30 day money back guarantee you can buy with confidence in the knowledge that if you find that the insoles aren’t for you then you can simply return them within 30 days to receive a full refund, no questions asked. 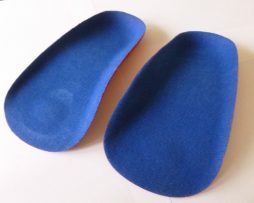 Ease aches and pain in your feet by correcting the bio-mechanics of your feet and giving your arches better support with a pair of these 3/4 length orthotic heel cup insoles. 2x High Quality 3/4 Length Orthotic Arch Supports (Left and Right foot). 3/4 length size ensure discrete and lightweight support that an be fitted into just about any type of shoes quickly and easily. Pressure and strain on your arches can cause inflammation and damage on the plantar fascia ligament that supports the arch of your foot. When this occurs it is known as plantar fasciitis and can cause mild to sever foot pain. 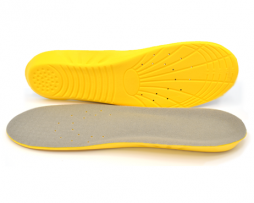 These orthotic insoles have been made with rigid arch support that will help to stop you from getting this foot injury by taking strain and pressure off the plantar fascia. Motion control technology helps to stop your feet from rolling inward too much during gait (excessive pronation) a common cause of plantar fasciitis and other foot and lower limb injuries. If you are a runner shock can overtime cause damage to your foot and lower limbs causing injuries to develop such as plantar fasciitis, shin splints and knee tendinitis. 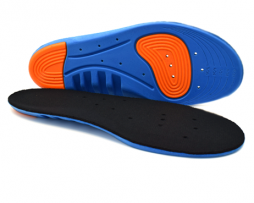 That is why these insoles have been made from high quality shock absorbing materials to protect your feet from shock. Heel cup and heel grip technology keeps your feet from moving around in your shoes and increasing ankle and foot stability. 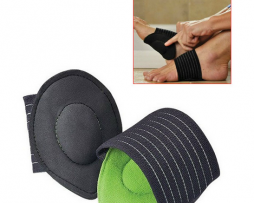 This helps to stop blisters, bunions as well as foot sprains and strains from occurring. 30 day money guarantee means you don't have to worry about these insoles not being right for you. As with our 30 day money back guarantee if you don't like them you can just send them back and we will give you a full refund. 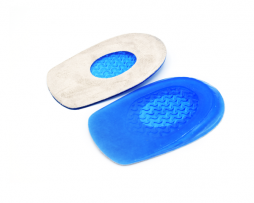 How can these FootReviver insoles for heel pain help you? The most common cause of heel pain in adults is due to plantar fasciitis. Plantar fasciitis is an overuse injury that is triggered by damage and inflammation to the plantar fascia ligament that supports the arch of your foot. If the underlining causes of your plantar fascitiis are not properly treated this injury will often get worsen, this can result in more severe foot and heel pain and in some circumstances heel spurs may develop. However, protecting your heels from plantar fasciitis and pain couldn't be simpler with a pair of these FootReviver insoles. 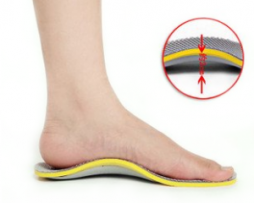 These insoles have been made to correct the way that your foot functions, this will, in turn, stop excessive strain and pressure from damaging your feet so that your feet can make a full recovery and eliminate heel and foot pain. 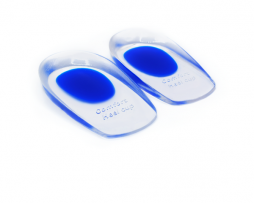 These Gel heel cups have been made from soothing ultra soft silicone gel brings instant relief to painful heels. Designed to absorb any shock or impact on the heel leading to a relief in pressure on the area. Ideal for people who are required to spend all day on their feet. Gives your heels and ankles more stability.